Comet Panstarrs C/2014 S2 in Draco the Dragon. Nov 30, 2015. Comet Lovejoy 2014 Q2 movement over a 4 day period as it passes double star 35 Cas. 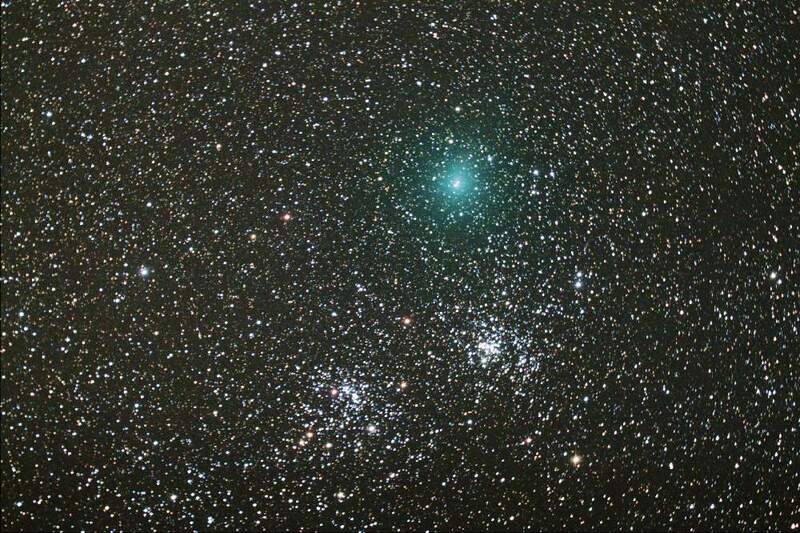 Comet Lovejoy 2014 Q2 as it passes NGC 457, the Owl or ET Cluster in Cassiopeia. 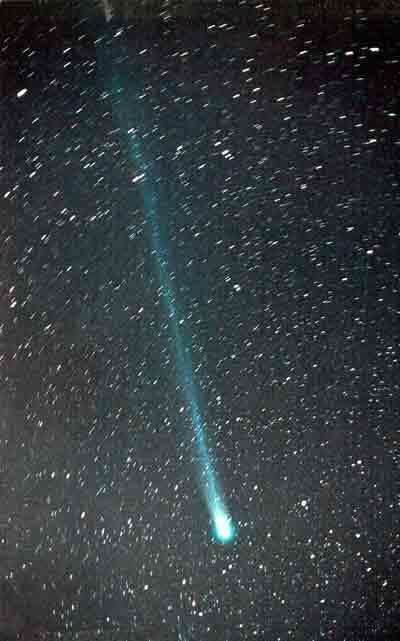 Comet Lovejoy 2014 Q2. A solar coronal mass ejection disrupts the long tail of the comet. 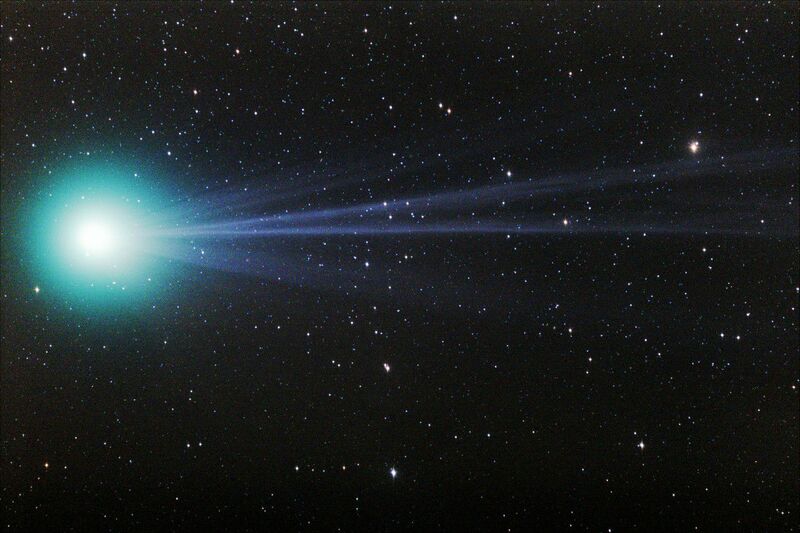 Comet Lovejoy 2014 Q2 on January 18th, 2015. 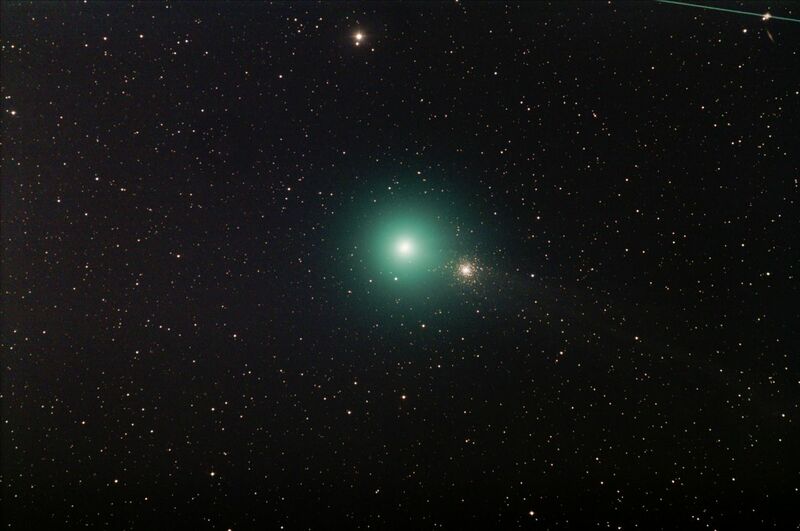 Comet Lovejoy 2014 Q2 as it passes M79 in the constellation of Lepus, the Hare. 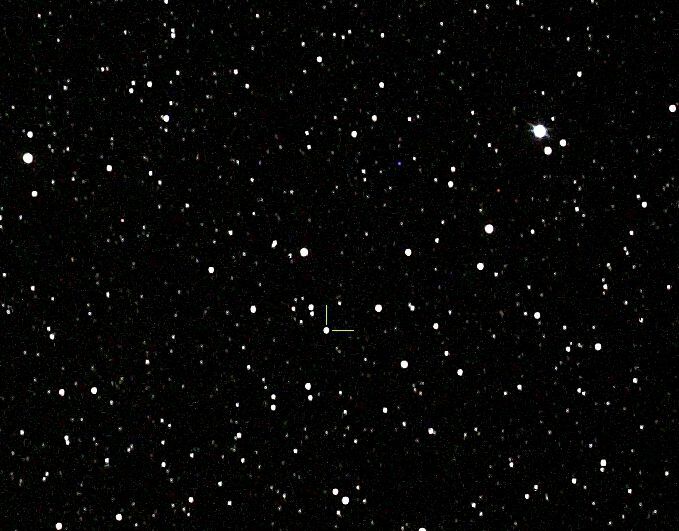 After 10 months, Nova Delphinus can still be seen telescopically. It may fade beyond its original 16 magnitude glow. 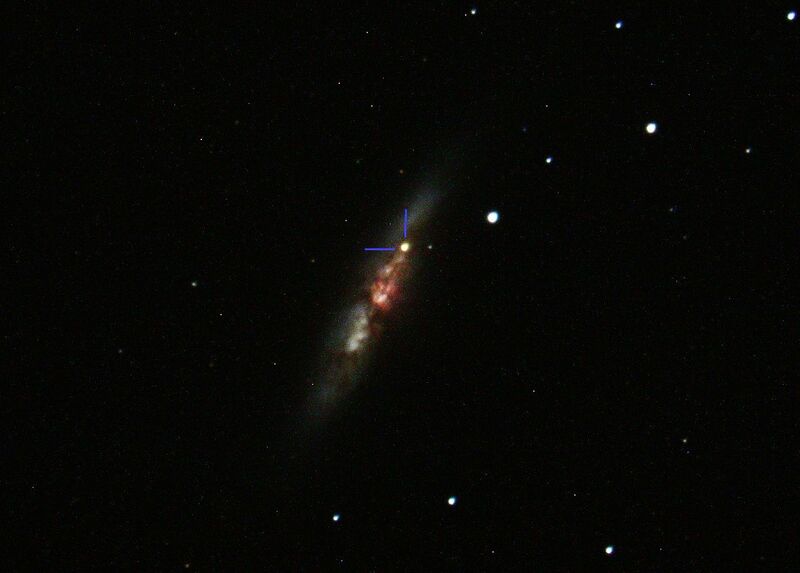 A Super Nova in the galaxy called M83 or the Cigar Galaxy is easily seen in small amateur telescopes. This galaxy is about 20 million light years away in the constellation of Ursa Major, the Big Dipper. 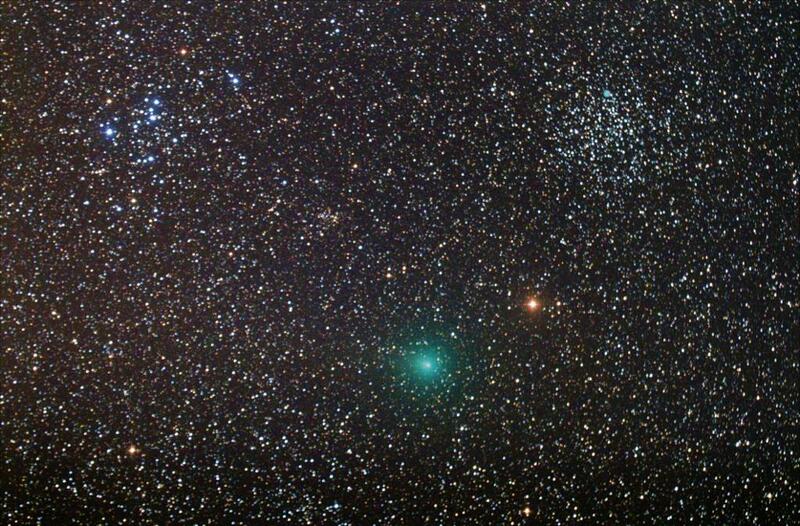 Comet LINEAR 2012/X1 as it cruises by the small globular cluster NGC 2419 on Feb 26th, 2014. 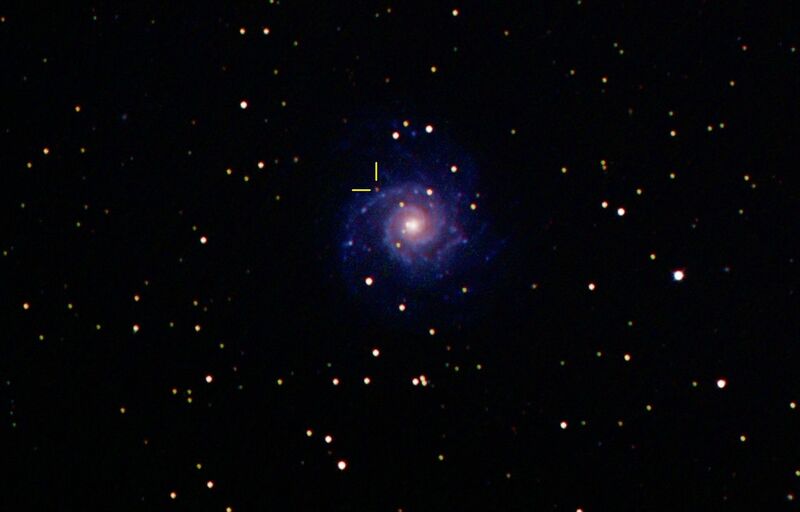 Another Super Nova is discovered in the Messier galaxy called M74. Taken on January 1st, 2014. 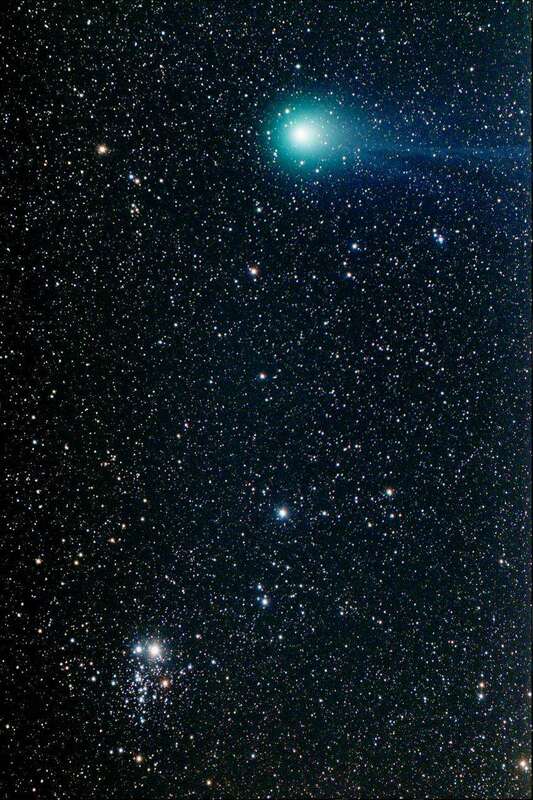 Comet Lovejoy C2013 R1 as it leaves the constellation Hercules on January 13th, 2014. 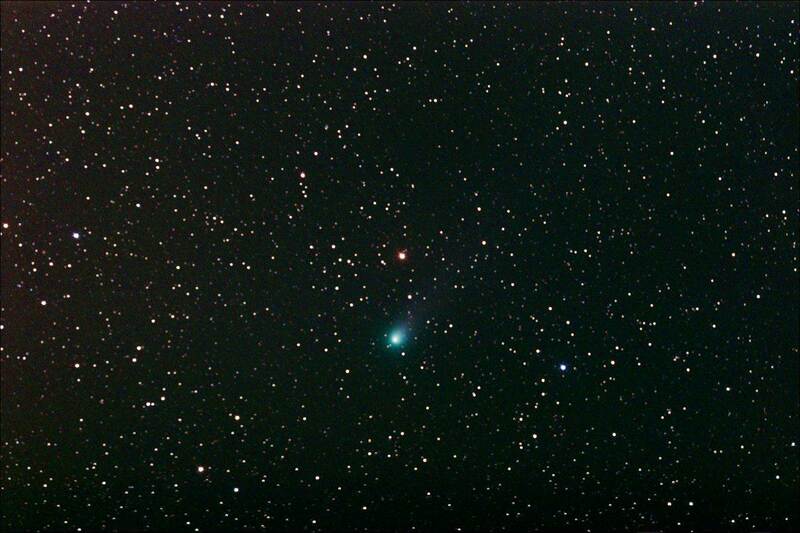 Comet Linear C/2012 X1 on January 13th, 2014 as it cruises thru the constellation Ophiuchus. 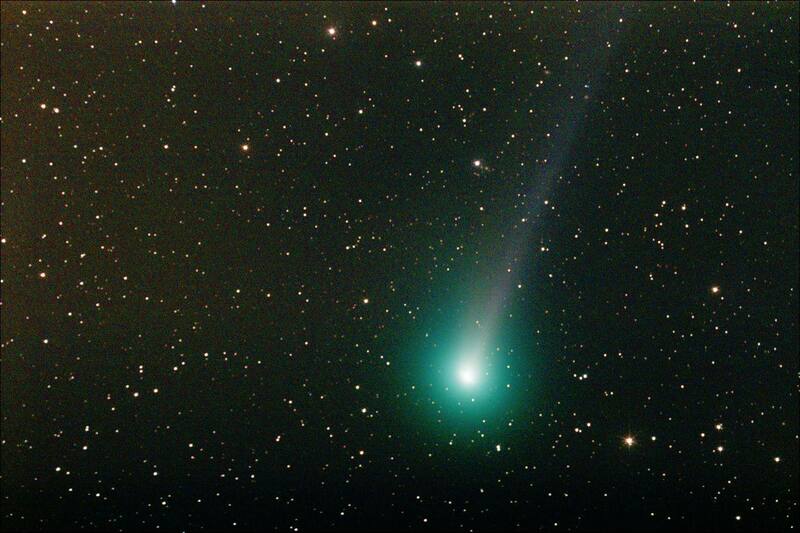 It will meet up with Comet Lovejoy from above on February 4th, 2014. 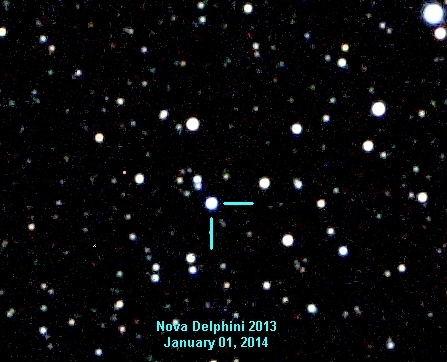 The new year has Nova Delphini holding at magnitude 10.5. 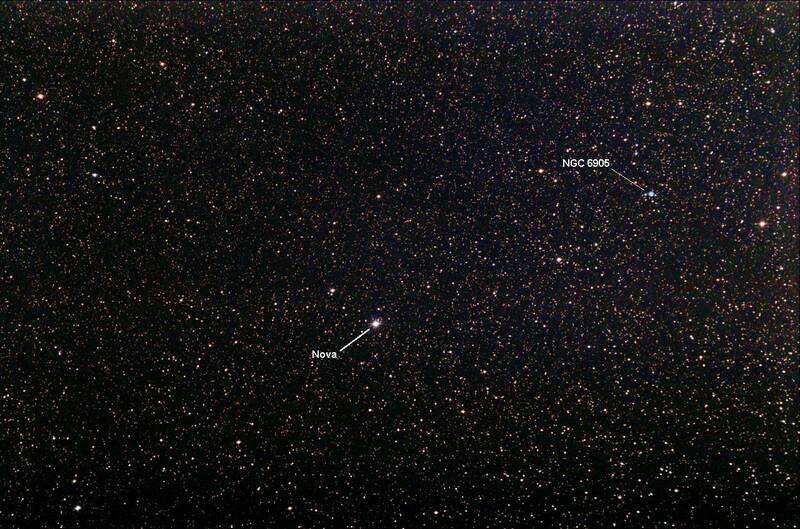 A nova was also discovered in the Messier object M74 just before Nova Delphini. This is a super nova class object about 30 million light years away in the constellation of Pisces. On November 17th, 2013, the Nova in Delphinus seems to be holding at magnitude 10.5 after blowing up on August 14th, 2013. The small blue ball is NGC 6905, a planetary nebula nearby. The star by the nebula is the comparison star for magnitude. 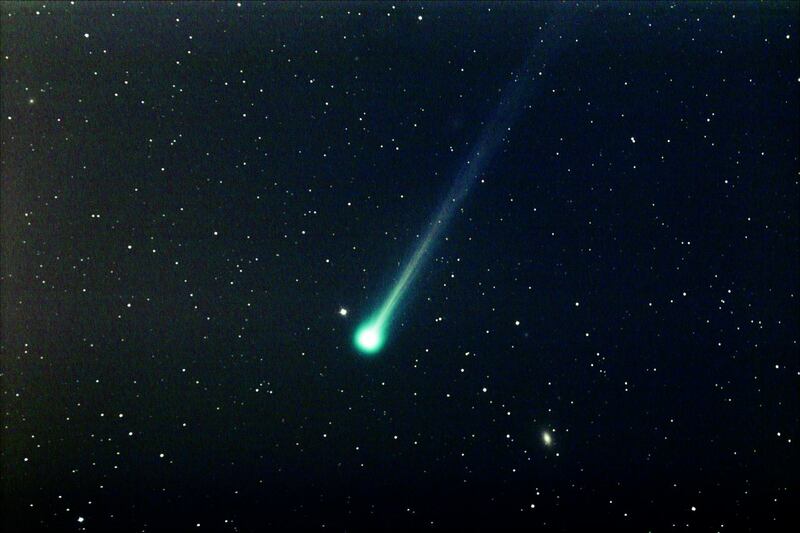 Comet ISON is brightening as it approaches the Sun, but will be tougher to see in the glow of Sun rise. This was taken on Nov 14th 2013 just before dawn. 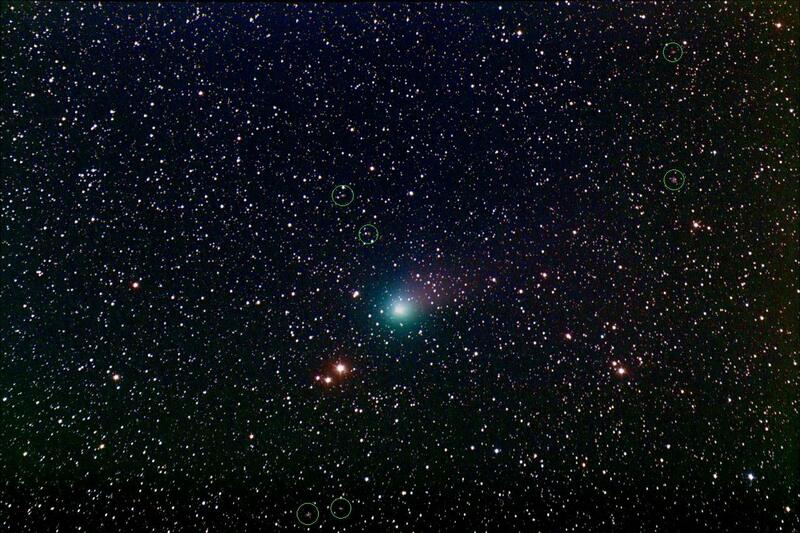 Comet Lovejoy R1 2013 has been high in the sky before Sun rise the past few weeks. This picture was taken the morning of November 12th, 2013. Click the below link for a video of 4 hour movement. A new nova in the Milky Way in the constellation Delphinus was discovered on August 14, 2012 by amateur astronomer Koichi Itagaki. Within 48 hours, the nova had increased in brightness over 1 million times and was able to be seen with the naked eye. The small planetary nebula NGC 6905 in the above picture is a star that exploded off its outer shell of hydrogen, but didn't have enough mass or energy to go nova or supernova. Click the above picture for a larger view. Update on the Nova in Delphinus on October 28th. The Nova has held steady for the past week at a magnitude of about 10.5. Finder chart for Nova Delphini 2013. Click the picture for a larger view. Day 1 and Day 2 of the nova in Delphinus. The nova brightened to naked eye view on Day 2. Day three shows the nova decreased a bit in brightness, but it is still naked eye visible. Magnitude comparisons to nearby stars show the nova at magnitude 5.0. This comparison was made on August 16th. Magnitude comparisons on the morning of August 12th show the nova holding steady at magnitude 5.0. 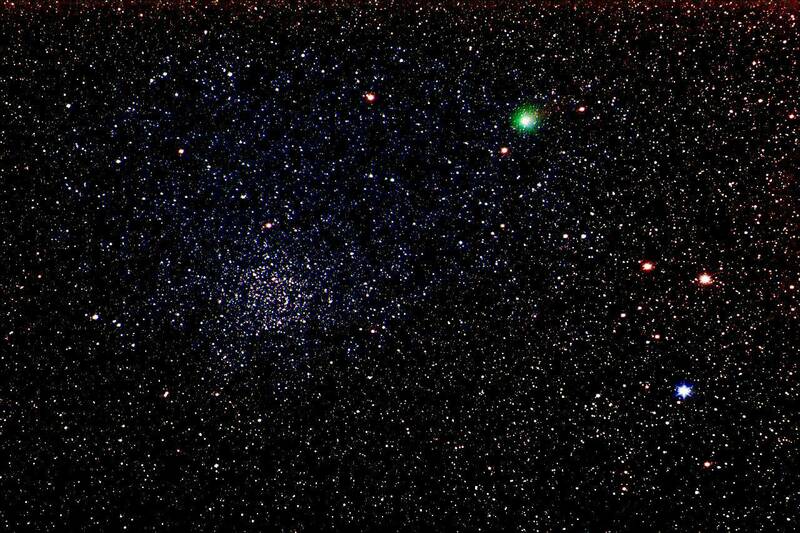 Comet Lemmon C/2012 F6 is an early morning site shown here on July 1st, 2013 passing the open cluster NGC 7789. 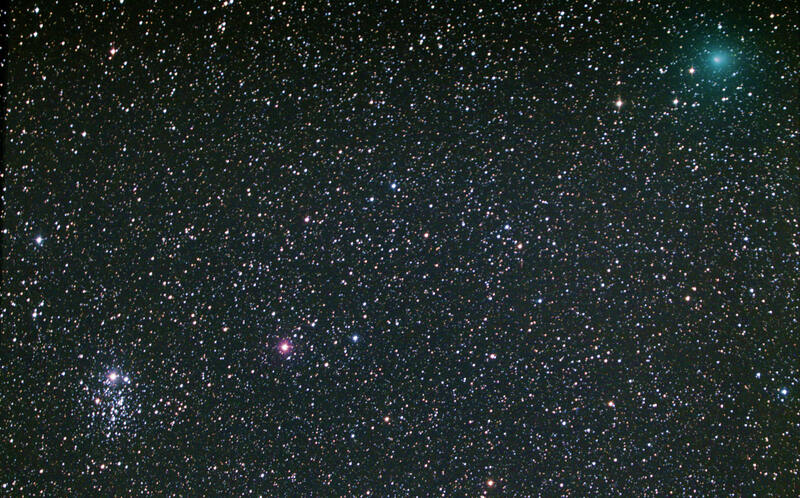 Comet Lemmon C/2012 F6 nears the open cluster Messier 52, or M52 in the constellation Cassiopeia on the morning of July 10th, 2013. 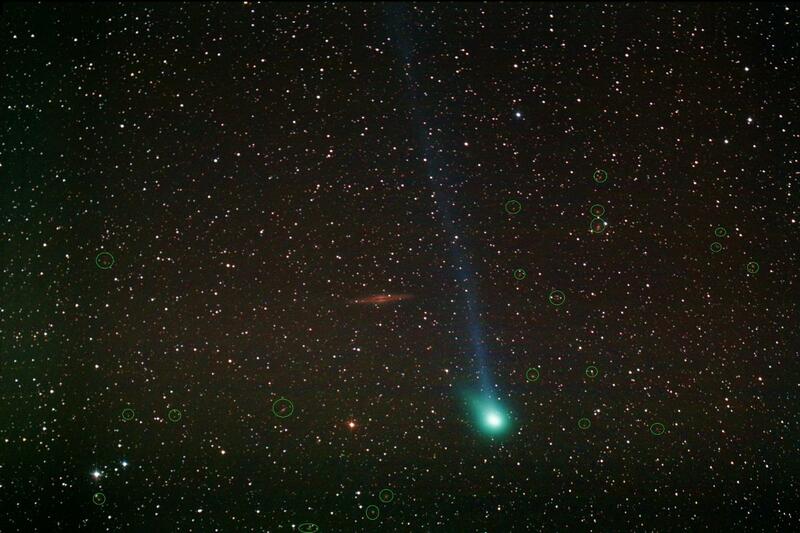 Comet Lemmon C/2012 F6 is an early morning site shown here on June 18th, 2013. 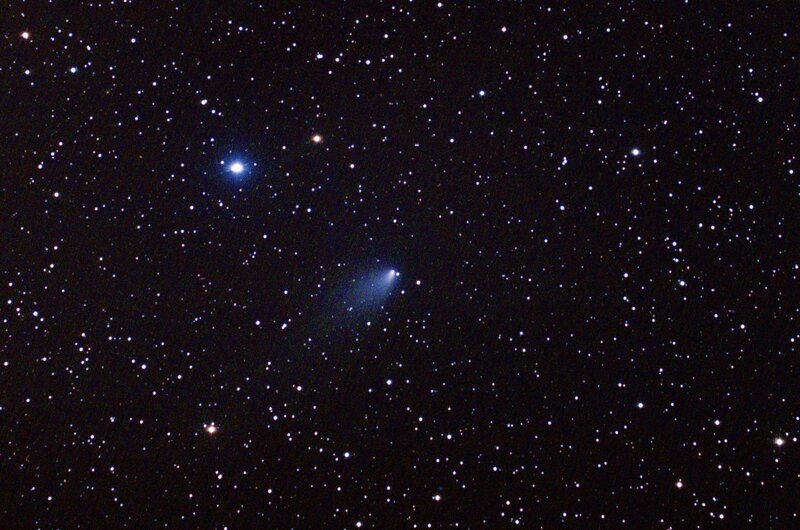 Comet Lemmon on June 20th. Note the two small stars by the Comet. In the above picture, the stars were to the left of the image. 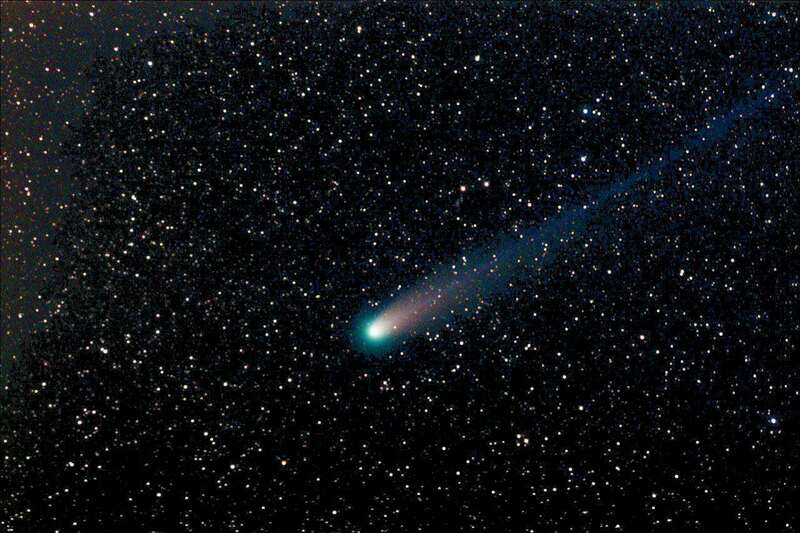 This shows how slow comets can move thru the sky. Click on the picture to see a full view. Small galaxies are circled. 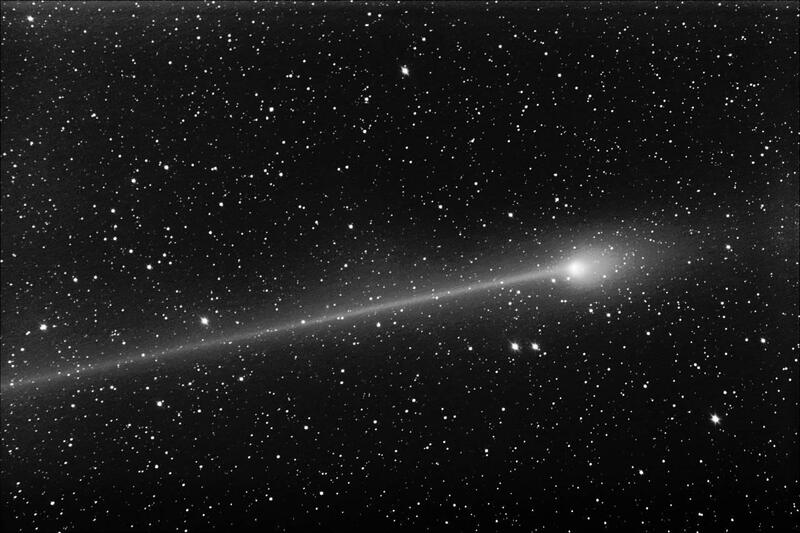 The comet is leaving the constellation of Andromeda on this date. 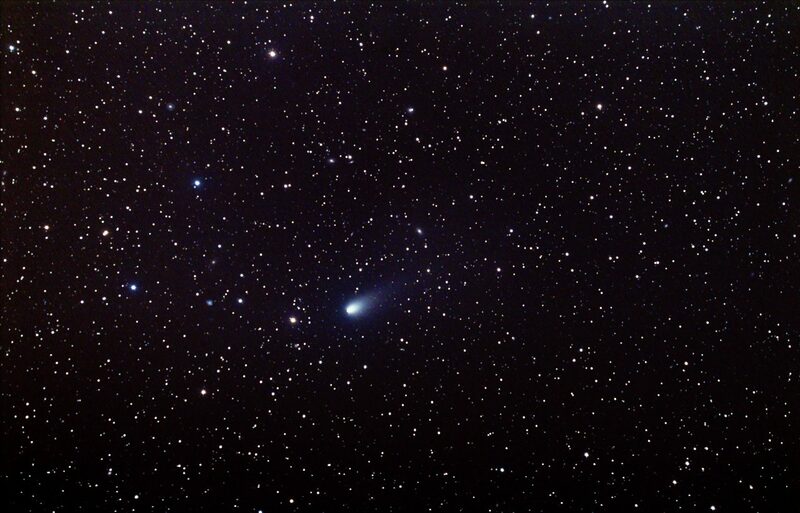 Comet Panstarrs makes a pass by a small galaxy PGC 52341 as it fades on July 30, 2013. 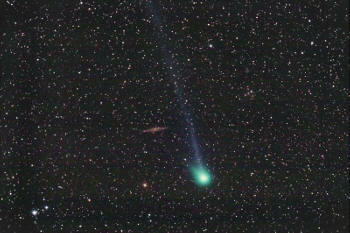 Comet Panstarrs 2011 L4 has been going thru changes on its path around our night skies. Click on the picture to see a full size montage. After Comet Panstarrs 2011 L4 rose out of the Sun's glare, it started heading north and was an easier site when it entered dark skies. This picture was from April 10th, 2013. 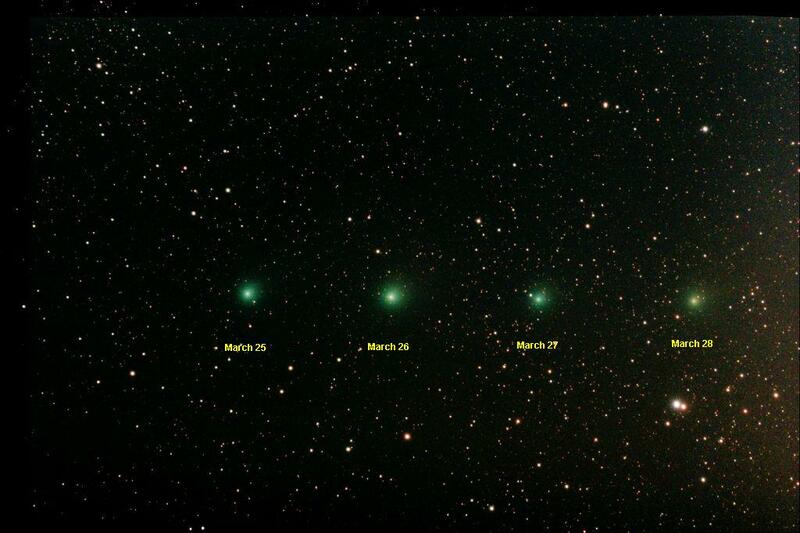 Comet Panstarrs on April 14th 2013. 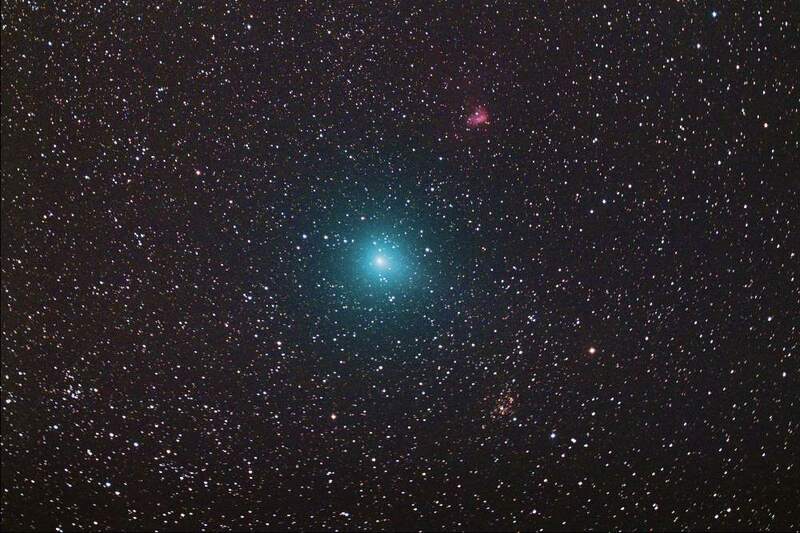 Comet Panstarrs seems to spread its wings as it heads towards Polaris on May 8th. 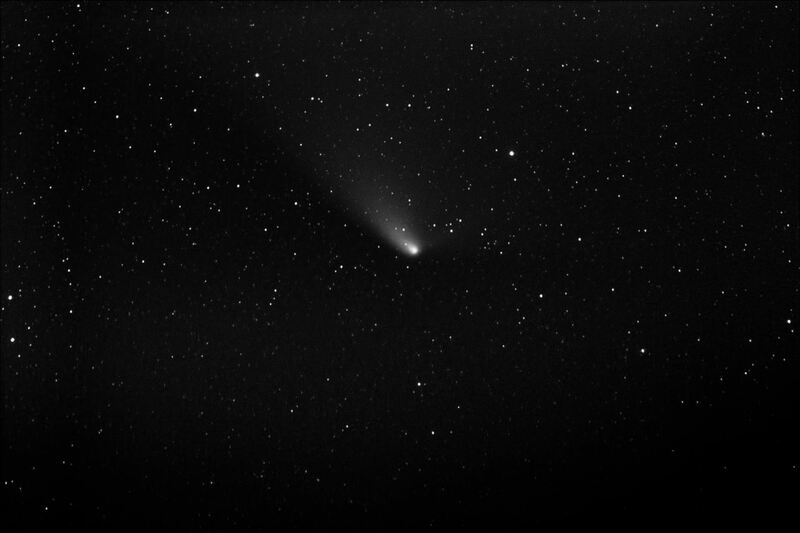 Comet Panstarrs has really gone thru changes in May. This May 26th picture shows off its very long tail. 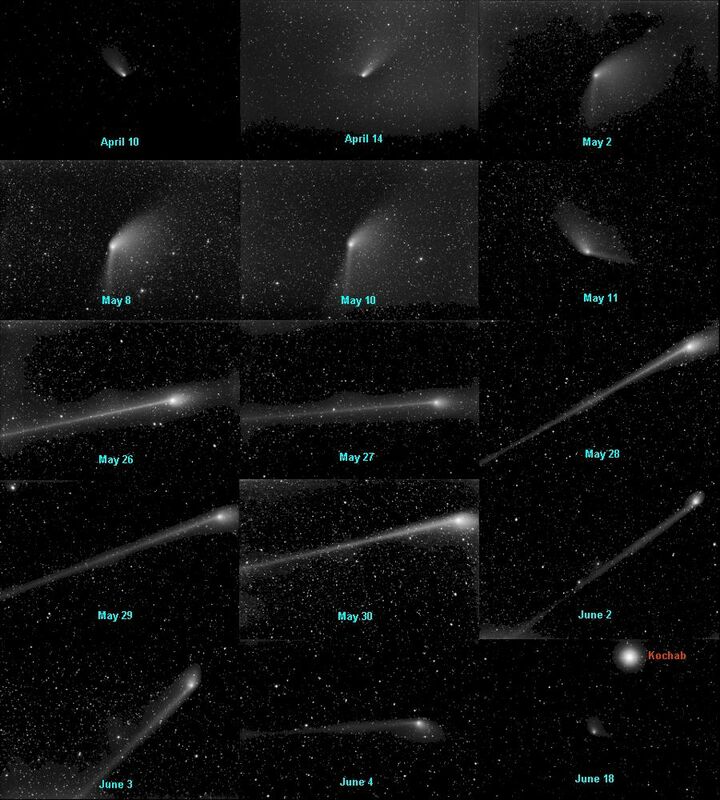 Comet Panstarrs has really gone thru changes in May. This May 28th, 2013 picture shows its tail is still quite long. 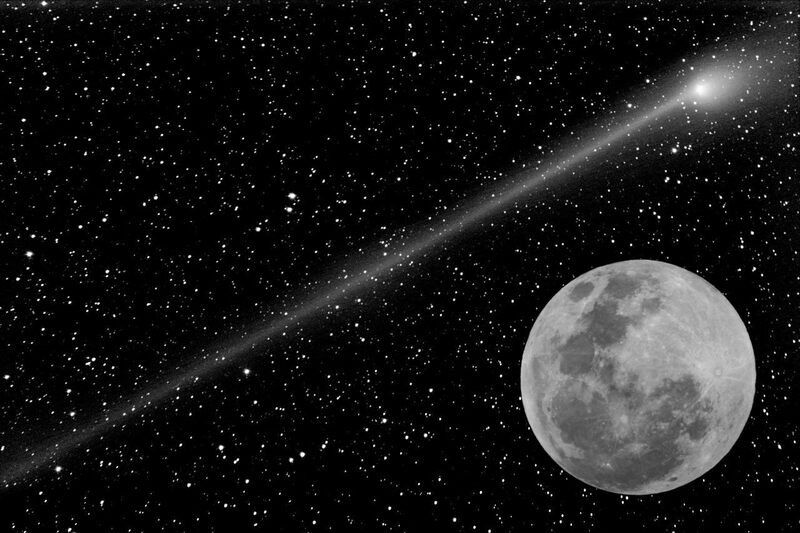 Comet Panstarrs is shown with the Moon pasted into the above picture to show the size of the overall comet. 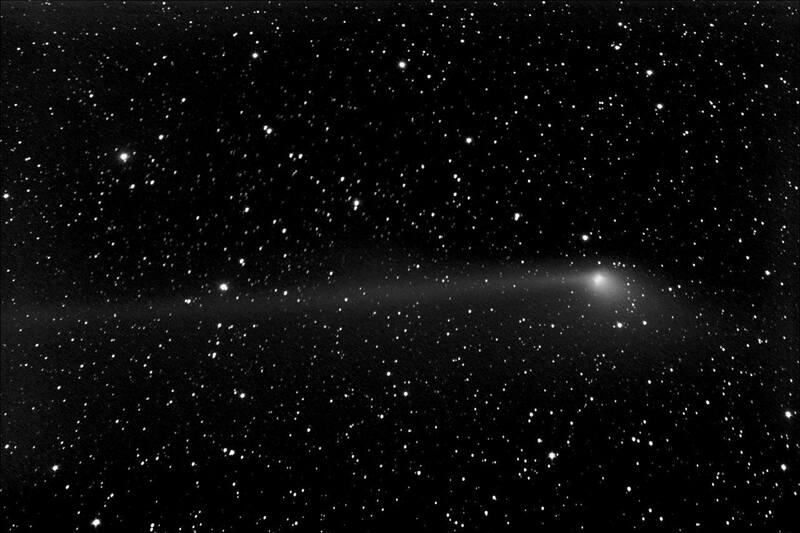 Comet Panstarrs begins to fade quickly as it goes into June. This is a June 2nd picture. June 4th, 2013 picture of Comet Panstarrs. 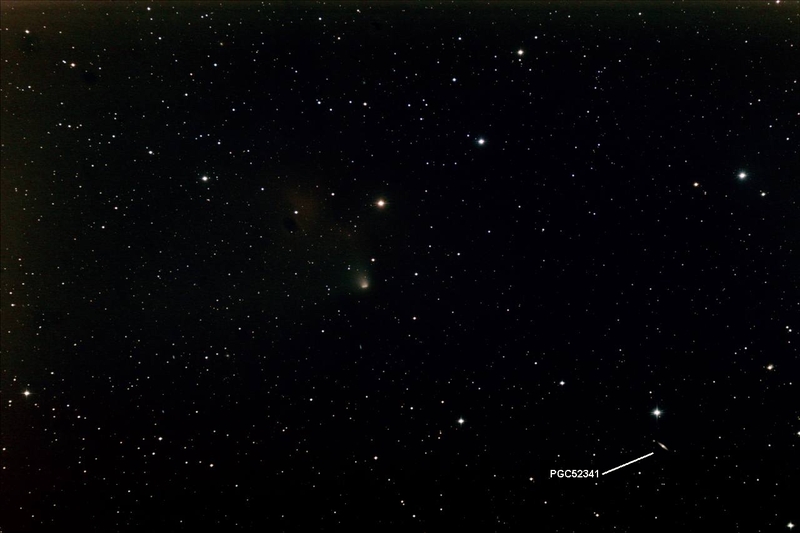 Comet Panstarrs passes near Kochab, the brightest star in Ursa Minor or the Little Dipper on June 18th, 2013. 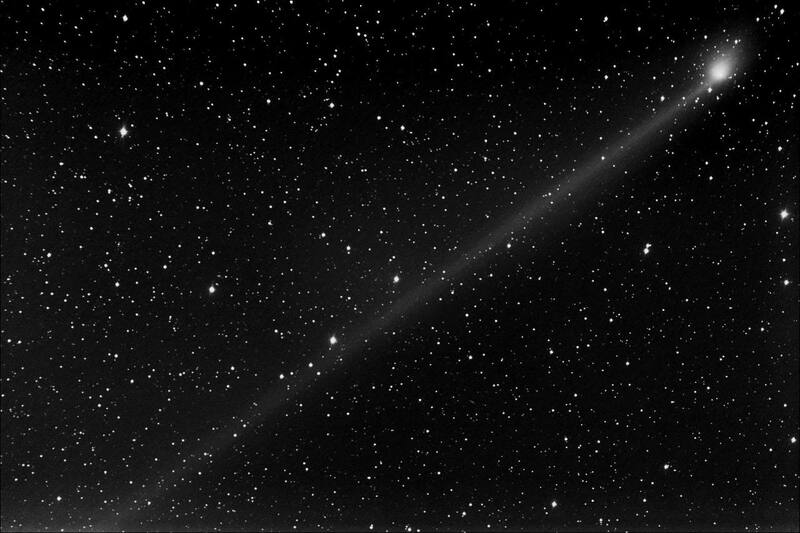 Comet Hergenrother 168P is promising to give astronomers a good show as it nears Earth. It has already had an outburst as it has been passing thru the constellation Pegasus. Looking closely at the larger picture and several small galaxies will be seen. To see a larger version click here. A video can be seen on U Tube here. 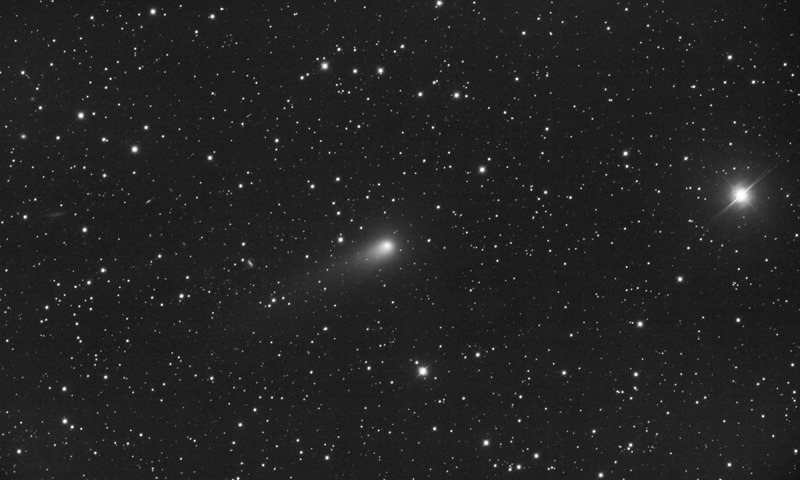 Although Comet Hergenrother 168P was reported to have broken into pieces, the main comet core is still intact and is providing nice views in November. The tail has a fan shape now after the breakup. Click here for a larger view. Comet Garradd 2009 P1 passes another small unique galaxy on April 17th, 2012 going thru the constellation of Camelopardalis. It's circumpolar at present and can be seen after sun set. 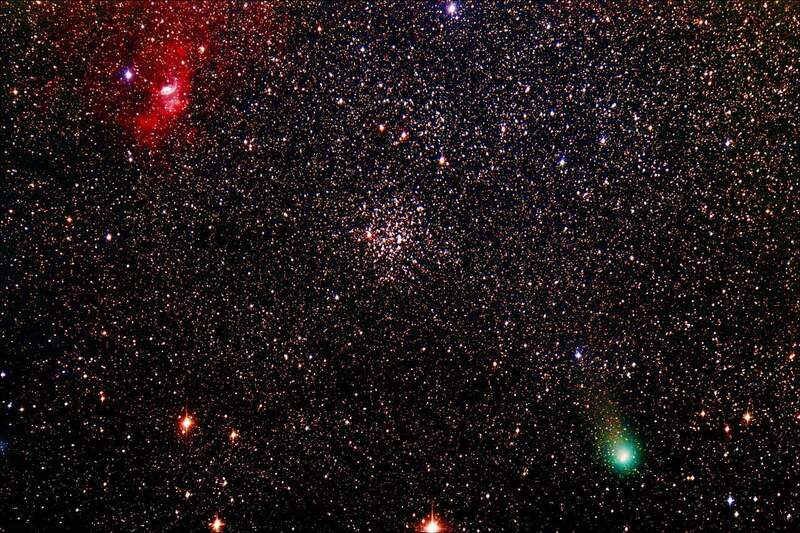 PGC29624 is to the upper right of the comet. 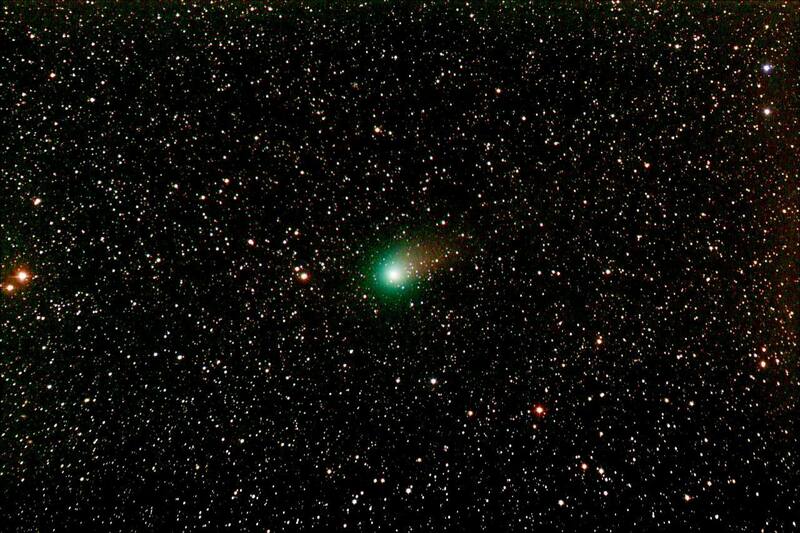 Comet Garradd 2009 P1 is still at it on March 20th, 2012 going thru the constellation of Draco. It's circumpolar at present and can be seen after sun set. 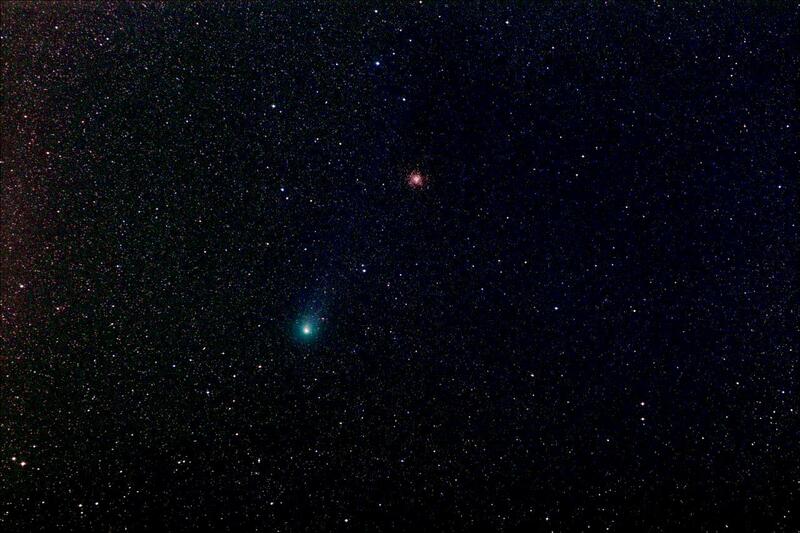 A small galaxy PGC 32321 is to the left of the comet. 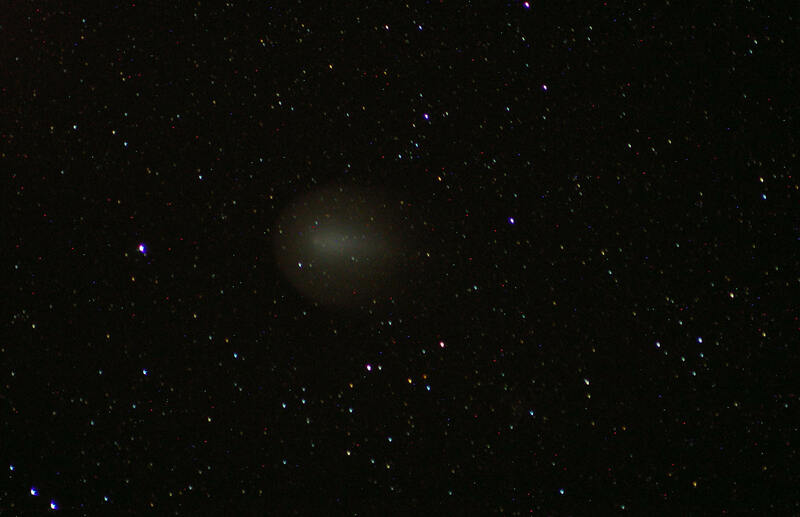 Comet Garradd 2009 P1 passes Caldwell 3 also known as NGC4236, a small galaxy in the constellation Draco. This near pass occurred on March 13th, 2012. 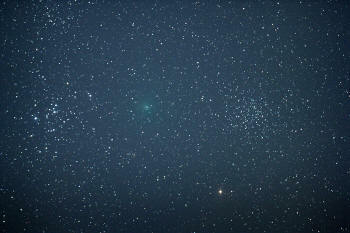 Comet Garradd 2009 P1 is still at it on February 1st, 2012 going thru the constellation of Hercules. It's a early morning object at present with this picture taken at 4AM. The tail has the appearance of a boomerang as it passes Messier object M92, a globular cluster. Comet Garradd 2009 P1 is still at it on November 14th, 2011. It is closing in on the Sun and starting to show some a bit of a fan tail. Comet Honda Mrosk Pajdusakova in the early morning the 1st of October, 2011. 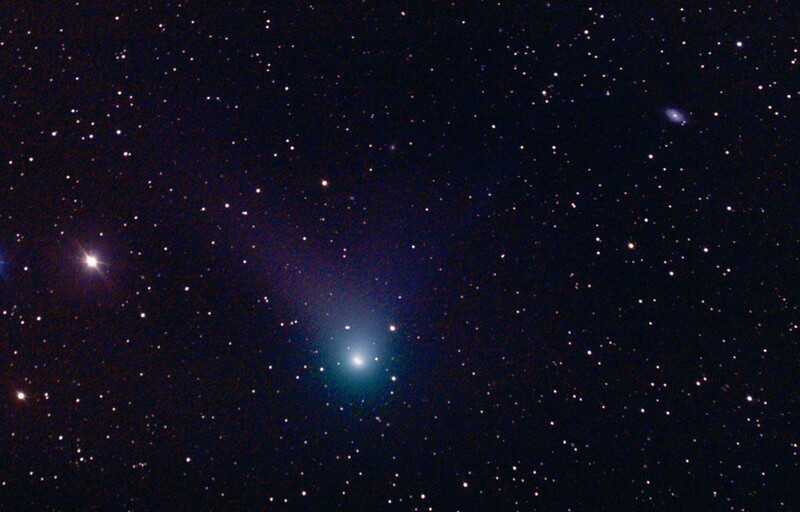 Comet Garradd 2009/P1 approaches the Coat Hanger Cluster on Sept 1st, 2011. 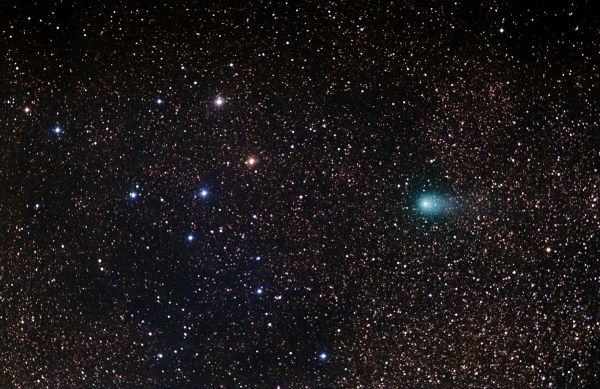 Comet Garradd 2009/P1 makes a close pass to Messier 15 on August 1st, 2011. 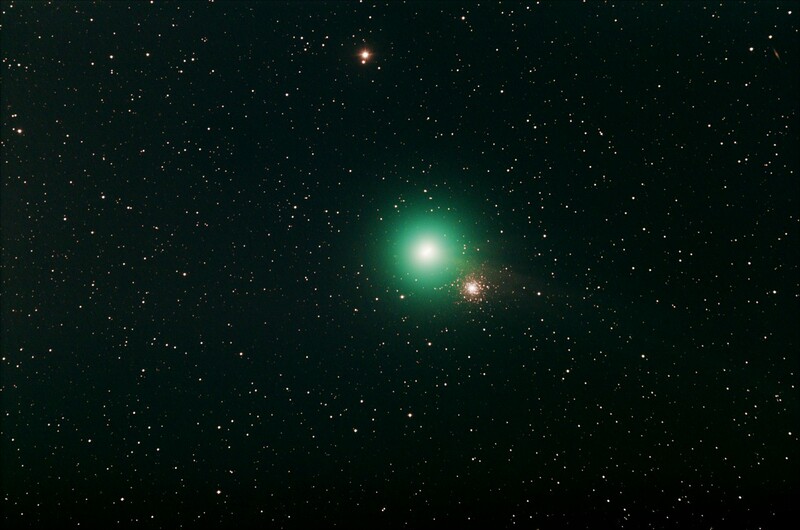 Comet Garradd 2009/P1 passes by Messier 71 on its route thru the solar system. 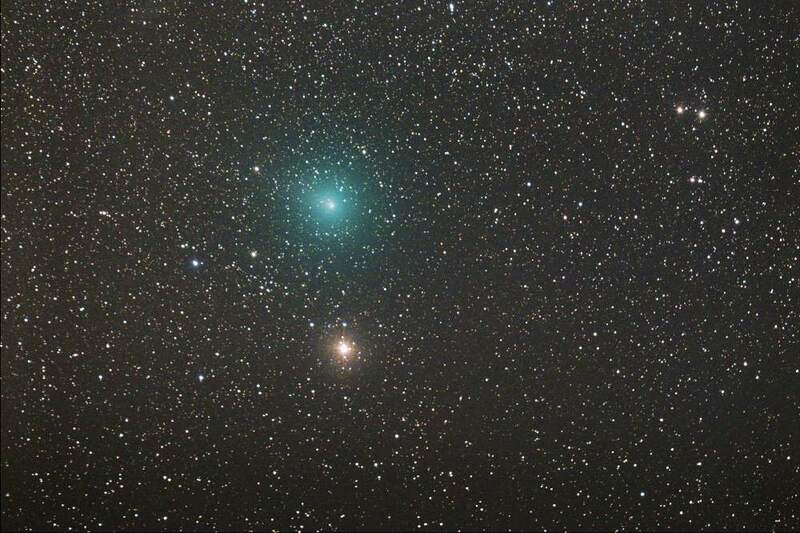 Comet Garradd P1 is the small green blob but, may become naked eye visible in late August or September, 2011. This picture was taken in July. 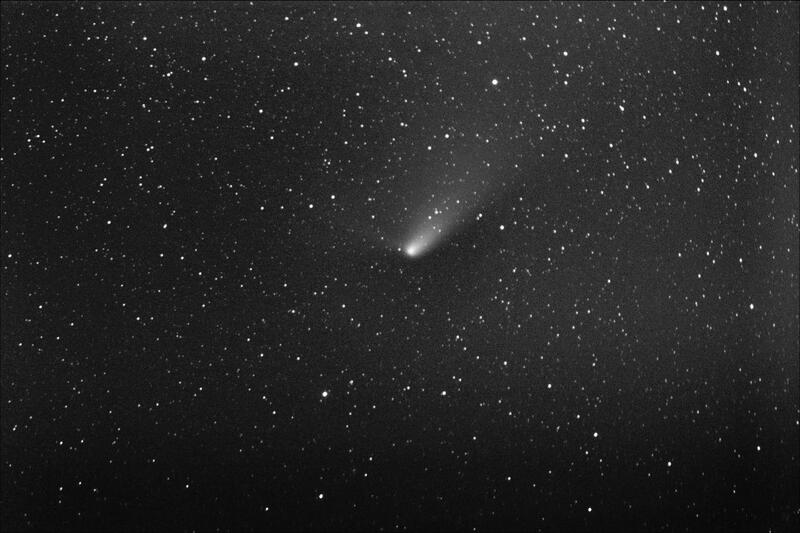 Comet Garradd P1 the first week of August, 2011 is starting to grow in size and sport a tail visually. 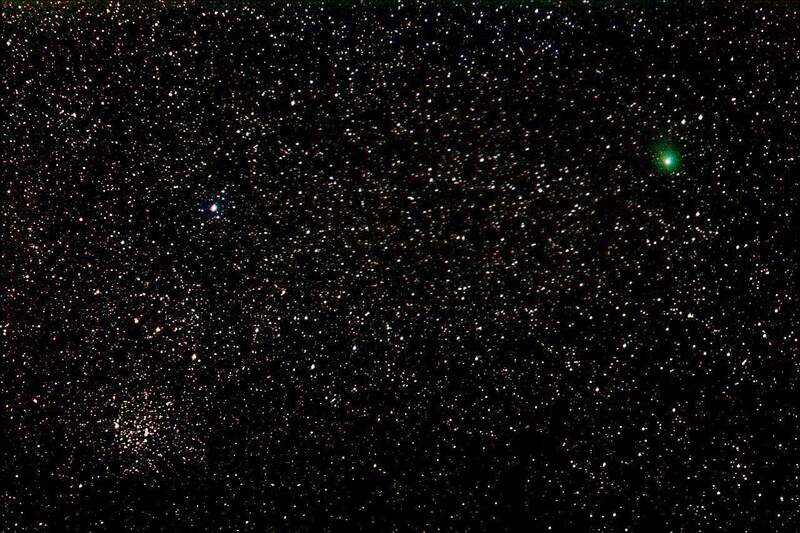 Comet Hartley 2 103P is the small green blob between M46 and M47. The haze is from a slight cloud layer obscuring the skies. Comet Hartley 2 103P approaches the Double Cluster in Perseus. Comet Hartley 2 103P is the green blob between M46 and M47. A small planetary nebula, NGC2438 can be seen in front of M46 on the right. Even the Pacman Nebula was not safe from Comet Hartley 2 103. 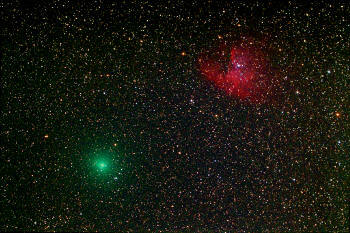 Comet Hartley 2 103P flies past the small nebula NGC 1491 in Perseus. 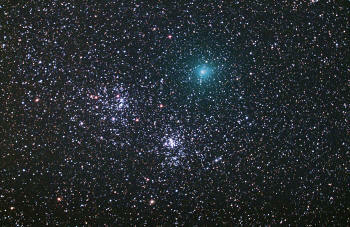 Comet Hartley 2 103P flies past the Double Cluster in Perseus. Click the thumbnail for the original size. Comet Hartley 2 103P flies past the Owl or ET Cluster in Cassiopeia. Click the thumbnail for the original size. Comet Hartley 2 103P heads towards the Double Cluster in Perseus. 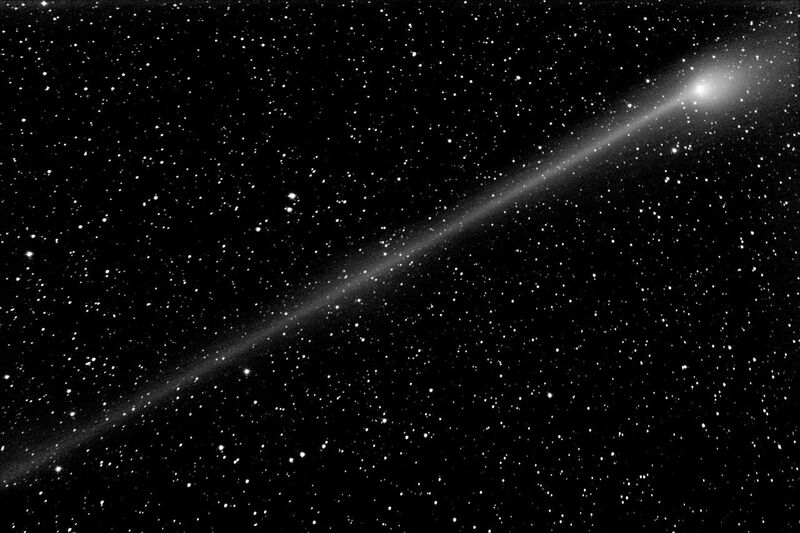 Comet Hartley 2 103P as it approaches Eta Persei. Comet McNaught R1 flies by a small galaxy NGC 891. 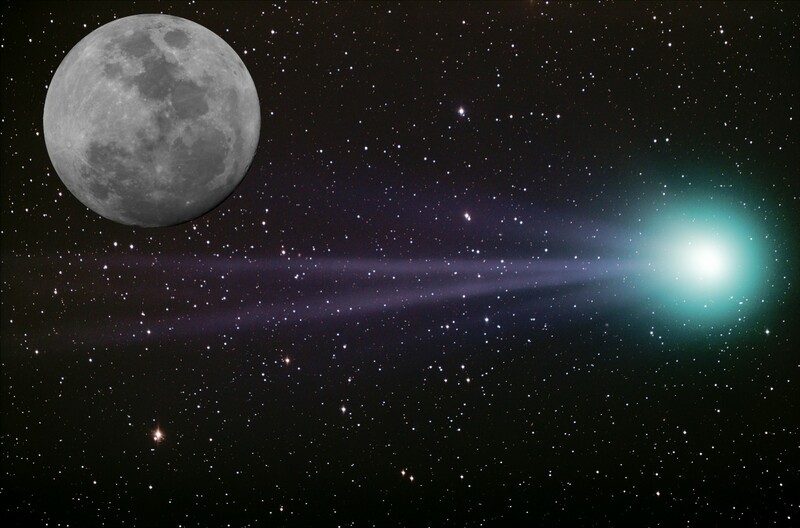 Comet McNaught R1 is located in an area chocked full of small galaxies. Click on the picture to display full size and see each galaxy circled in green. 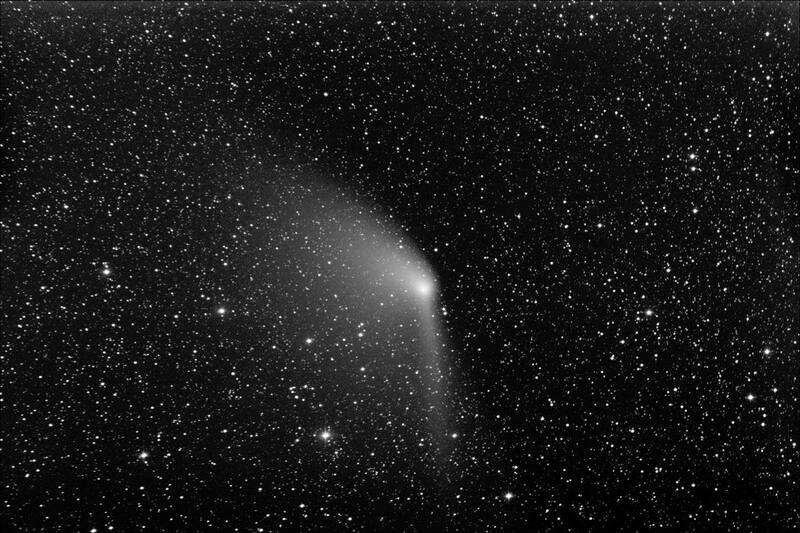 Comet Holmes 7P put on quite a show in 2007. After apparently striking an asteroid, it grew in brightness nearly 1 million times. 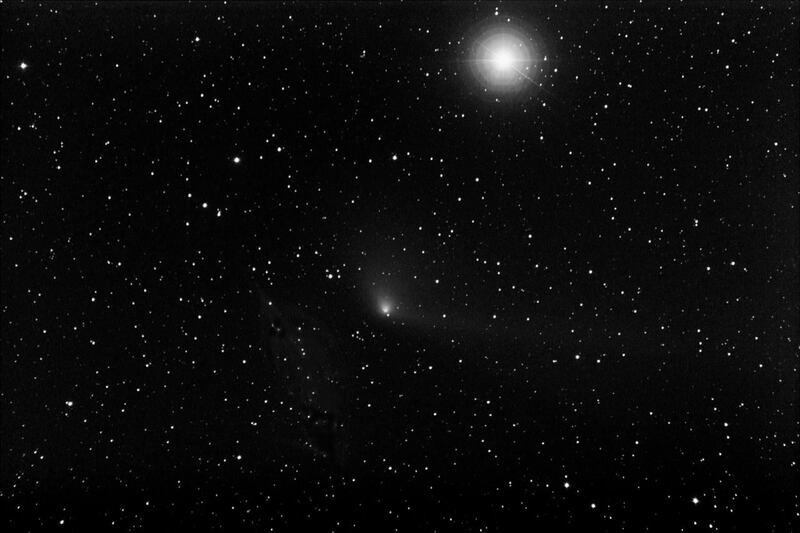 Back in the Old Days, Doug Ostroski used a film camera to capture this comet. 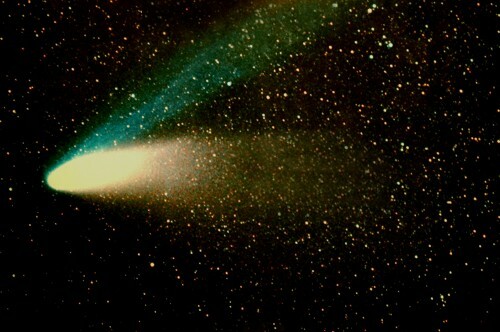 Comet Hale Bopp. The telescope that discovered it was built and owned by our own member Jim Stevens.